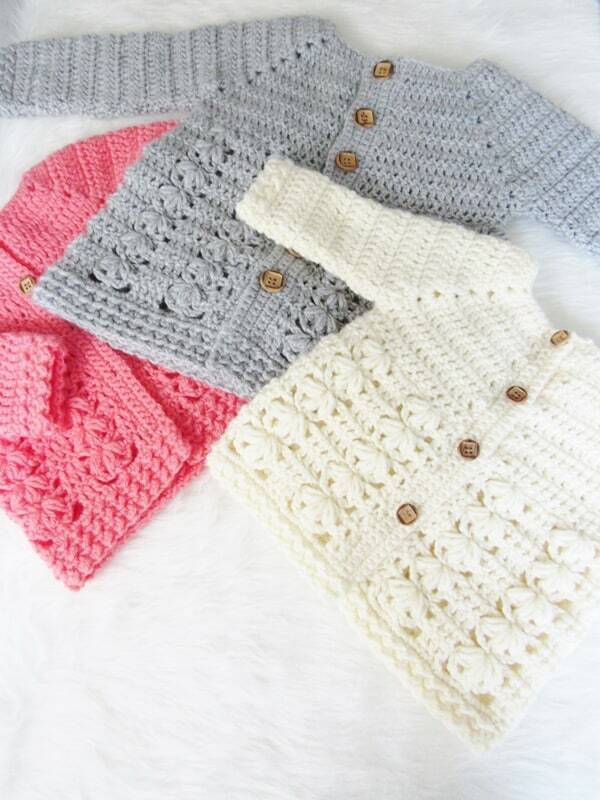 I am really excited to present to you my very first crochet baby sweater pattern. I am wondering what took me so long to design one. Going by the response I received for this sweater on Instagram and Facebook, I am hoping that you will love it as much as I do. I was under the impression that a Raglan baby sweater would be pretty easy to design but getting the sizes right took me way longer than expected. Getting the chest and the armholes right sucked the life out of me, but hey, all is well that ends well, right? I am in love with this design. Though designing this was tough, making one following my pattern is going to be a breeze. A Raglan is in fact very easy to work up as there is no shaping involved for the armholes and neck. 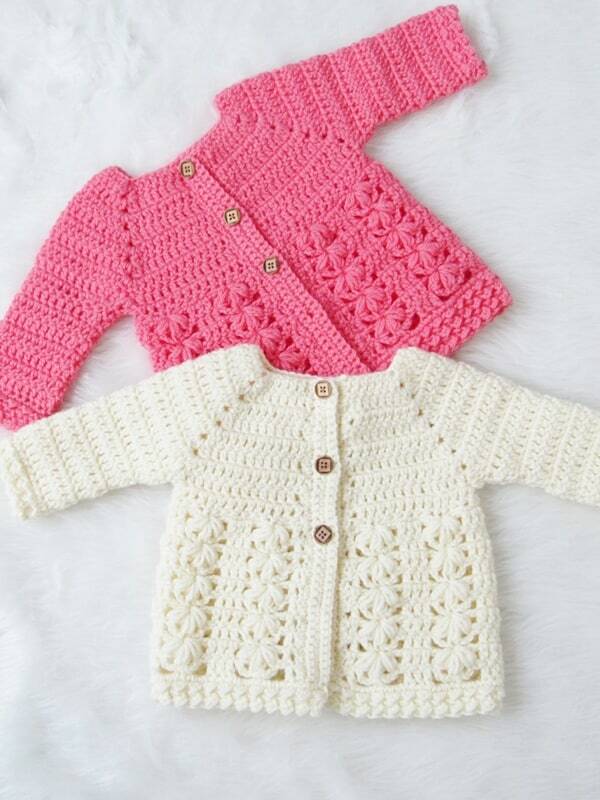 If you are bored seeing the simple baby sweaters, this crochet baby sweater with a unique stitch will be your new best friend. The body of the sweater features puff stitches that look like stacked flowers. The hem and the cuffs have oodles of texture too. All the stitches used are simple and easy, but combining them in the right way is what makes a design truly unique. I am a big advocate of affordable yarns. When I design, I try to keep the expense to the minimum, so my readers don’t have to spend a lot. I love Lion Brand Vanna’s choice yarn because it is affordable and comes in a wide range of colors. Last time I went to JoAnn’s I saw a new blue that was simply gorgeous. That color is next on my list. 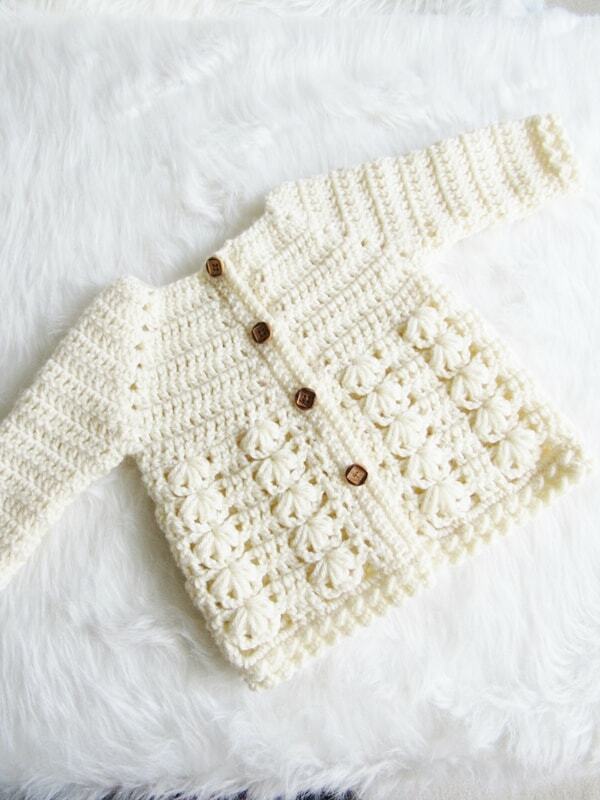 This yarn has the right thickness and softness for a baby coat. Just imagine the different colors you can pick. The sky is the limit. Honestly, I didn’t really think anyone would remember Lionbrand Vanna’s Choice when they wanted to make a baby item but I was pleasantly surprised by the outcome. Can you tell how much I love these from the gazillion pictures I took? 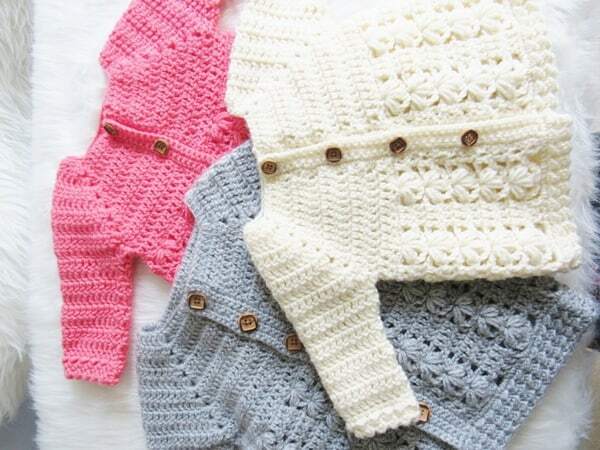 * This crochet pattern is written in standard US terms. You can see a US to UK conversion chart here. 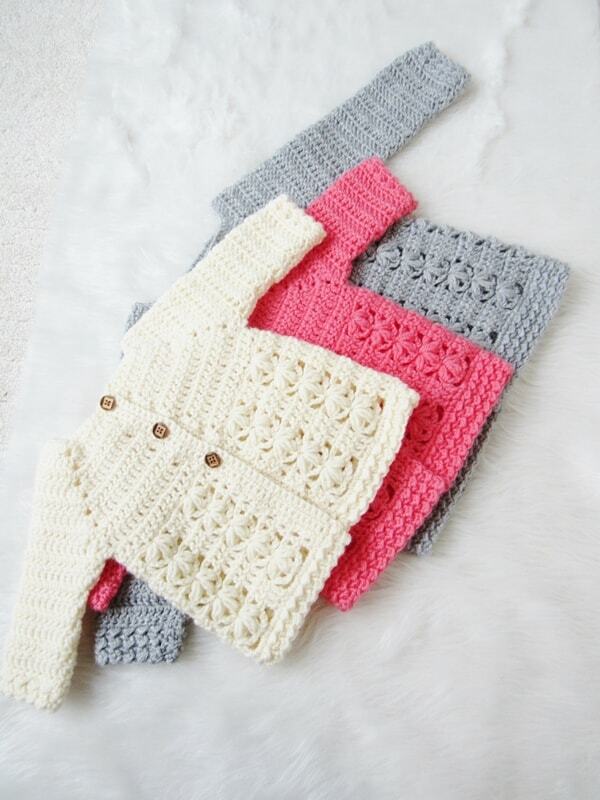 * It includes 6 sizes- 0-3 Months, 3-6 Months, 6-12 Months, 12-24 Months, 2T and 3/4T. * The pattern is designed with a 3-4 inch positive ease. 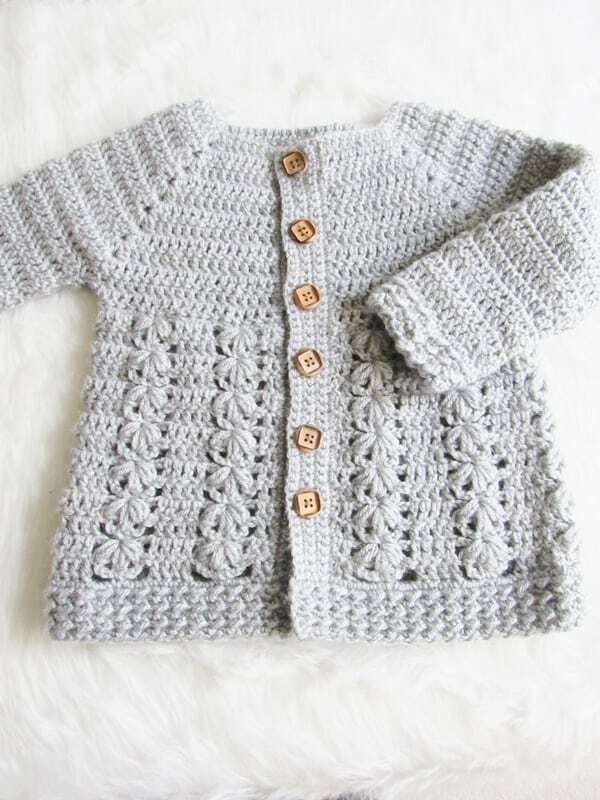 * Worsted weight (size 4) yarn is used to make the sweater. That would be a 10 ply in Australia and Aran in the UK. I used Lion Brand Vanna’s Choice in colors Pink Grapefruit, silver Heather and Fisherman. * An H (5mm) hook is used for the body of the sweater and an I(5.5mm) hook is used for the hem and the sleeve cuffs. * This is a Raglan sweater and the neck and the armholes are easily made without much shaping. * The sleeves are worked directly on to the armholes and not made separately. So there is no sewing involved. * Sizes 0-3 and 3-6 took only 2 skeins of Vanna’s choice yarn. The bigger sizes took 3 to 5 skeins. Payment can be made securely through PayPal using your credit card or PayPal account, see FAQ for details. 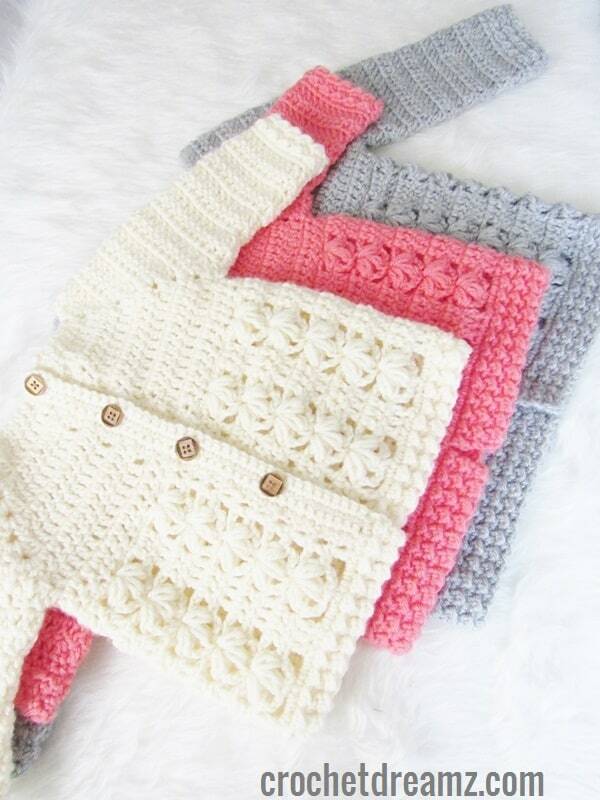 The pattern will be emailed to you within 24 hours, actually much sooner. If you have any questions or fail to receive the patterns please use the ‘Contact Me’ form on my blog, top right. Please do not resell the pattern itself or pass it onto others. All my patterns are protected by copyright. Read my Copyright page for more info. 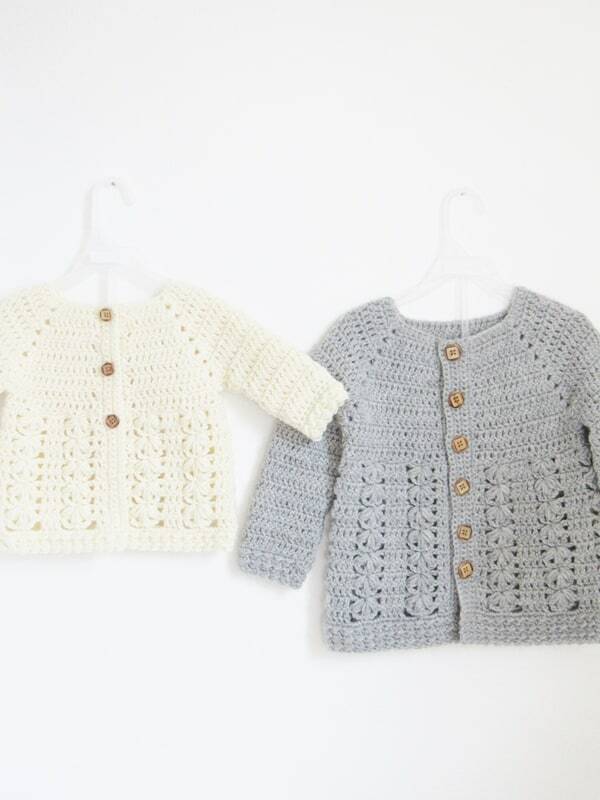 If you love crocheting cardigans and sweaters, you might also like my Bentley Baby Boy Sweater and my Vanessa pullover for women found here. Thank you so much, Jan. I am really glad you like my work. Hi! I purchased the Evelyn sweater through PayPal and unfortunately, my old email address was attached. I don’t have access to it anymore. Would it be possible to send it to my current email? I have forwarded it to your new address. Thank you, the pattern has been emailed to you. I have emailed the pattern to you. I hope you received it. I cannot get my stitch count on row 4 to come out. Any ideas? Kindly email me at mycrochetdreamz(at) gmail (dot)com and let me know the size you are working on and the stitch count you are ending up with. I am about to catch a flight and will reach my destination only after 24 hours. I might be late in replying to you, I apologize in advance. 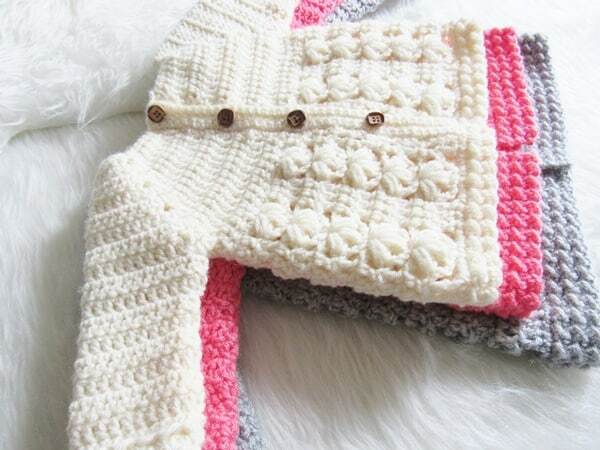 Do you have any plans to make this pattern in a larger size? 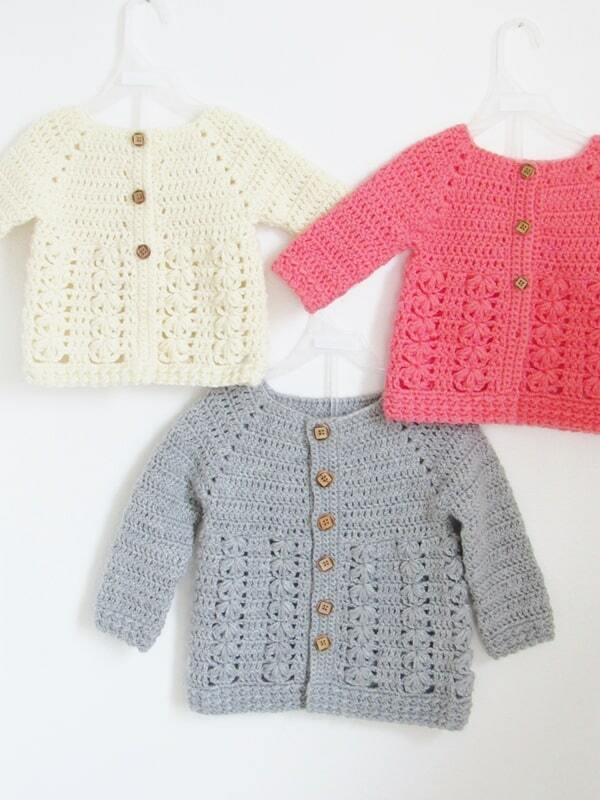 My granddaughters are three and five and I would love to make them each one of these! Hi Jana, as of now the pattern only runs up to 3/4T. I might come up with bigger sizes if there is enough demand for it. I just purchased a sweater pattern from you. Will that be emailed to me. The Evelyn sweater. Yes, the patterns on my blog are emailed and not set up for instant download. Just purchased the pattern- can’t wait to get it and start!! Just purchased this pattern. Can’t wait to give it a try.